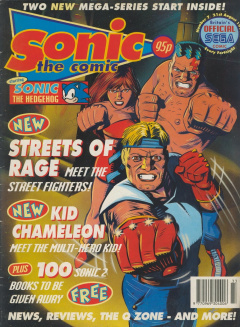 Sonic the Comic 7 is the seventh issue of the Sonic the Comic series by Fleetway. This cover style changed slightly for this issue, and it is also notable for including Super Sonic's first appearance. The non-comic 'zones' of this issue were the Control Zone (Introductions and Staff Details), Review Zone (Games across all current SEGA platforms reviewed on a % scale), News Zone (Information on upcoming SEGA events and products), Q Zone (Cheats, Game Genie codes and strategies for popular or requested games), and Speedlines (Reader letters and artwork, with replies from Megadroid, the comic's mascot character). Sonic and Tails arrive in the Oil Ocean Zone after being called by a lion named Red and his colleagues, who have been tasked with cleaning up the oil in the Zone. Red and his men have been fighting a fire for three days, but they haven't made any progress and fear that the entire Zone might go up in flames. Sonic, however, quickly douses the fire with a Sonic-Cyclone, running around the fire so fast that he creates a vacuum at the base. Relieved, Red asks for Sonic's help in deactivating the myriad traps around the zone so that he can finish the job. Just then, an Aquis badnik attacks Sonic from behind. The badnik manages to force Sonic into the oil, then sets it alight, apparently destroying him. However, Super Sonic emerges from the flames. He chases the Aquis across the Zone, destroying it and releasing its organic battery: a small rabbit. Unfortunately, Super Sonic is nearly mindless, and seeks to kill the rabbit, as well as Tails and Red when they go to help. Luckily, Tails manages to remind Sonic who he is and that they came to the Zone to help, calming him down and returning him to cool blue. Now back in his right mind, Sonic promises to deactivate the Oil Ocean traps within five minutes - and does so. This issue confirms that the events of Sonic the Comic take place after the events of Sonic the Hedgehog 2, which was mentioned in Sonic the Comic #6, "Attack on the Death Egg". Super Sonic appears for the first time. It is revealed that Sonic has little-to-no control over his Super form, who is violent and will attack even innocent bystanders. Tails mentions that he has seen Sonic transform into Super Sonic only once before, when Sonic absorbed too many Mobius Rings (presumably during the events of Sonic the Hedgehog 2), although now Sonic is able to transform without rings, whenever he is under great pressure. 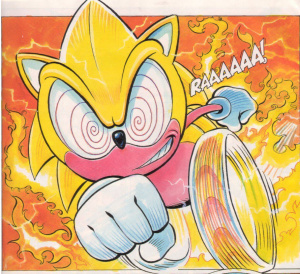 Sonic's earliest transformation into Super Sonic was before his first meeting with Tails, and is depicted in Sonic the Comic #27, "Part 2: A Tale of Tails". Although printed first, this story was written after the scripts for issues #8 and #9. (Reference: Comment #12606 at sonicthecomic Yahoo! Group, posted by Nigel Kitching). A kid named Casey fights for his life in a new walk-in virtual reality video game called Wildside, facing pterodactyls, robot dogs, evil scarecrows, and even a runaway combine harvester. He flashes back to earlier in the day, when he was a regular kid playing video games (including Sonic the Hedgehog 2). His mom sends him out to meet their new next door neighbour, Suzi, so Casey heads out to the arcade, where a new game system named Wildside is opening. He meets Suzi, but humiliates himself by falling off his skateboard. A local jock named Brad swoops in and takes Suzi to be the first players at Wildside. Casey waits for three hours, but Suzi and Brad do not emerge from the game. Eventually, the doors open and Casey goes inside, where a disembodied voice welcomes him as a worthy challenger, and refers to him as "Chameleon". Suddenly, Casey finds himself beset on all sides by solid holograms. He tries to flee on his skateboard, to no avail. However, when he takes off his sunglasses, he suddenly transforms in to a samurai warrior in crimson armour: Red Stealth! Casey has a Sonic poster on the back of his bedroom door. Ten minutes into the future, beat cop Axel Stone is lured into Finch Alley and beaten to within an inch of his life by corrupt cops, who hate him for squealing. Although he survives, he is placed on life support in a hospital. His friends, Blaze Fielding and Max Hatchet (also both cops), decide that they cannot continue to work for such a corrupt police force. They accuse their Captain Wyndham of taking bribes, then quit, intending to track down the creeps who attacked Axel on their own. A panicked Wyndham makes a phonecall to an individual named Hawk, apparently a big-time criminal, who takes a personal interest in Fielding and Hatchet's departure. Shion the Wonder Boy has now transformed half-way into a demon, after being marked by Grimomen the Demon Lord, and his demon half is attempting to kill him! With his still-human arm he manages to strap down his demon arm to stop it strangling him. Then he makes his way towards Grimomen's Pitcastle. He steal a flying rowboat in order to enter. As he approaches Grimomen's lair, he finds humans chained up on the walls being transformed into demons. One says that Grimomen is building an army. Finally, Shion confronts Grimomen in his throne room, but the demon merely scoffs at him and grabs him around the chest, saying that soon he will be the Demon Lord's slave! In Grimomen's throne room, Sonic the Hedgehog's head, shoe, and a copy of Sonic the Comic can be seen on the floor.